Level of grinding and final finishes. How much stone should be visible & how durable should a floor be? 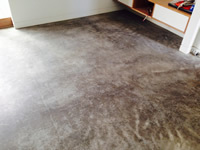 FAQs about polished concrete floors, finishes, acid etching, maintenance, cleaning and more. 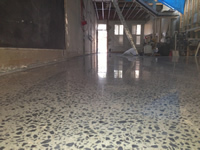 The CCC Polished Concrete team includes some of the most experienced and passionate floor grinding and polishing specialists in Melbourne. We polish existing and new concrete floors using state of the art equipment to suit your polished concrete requirements. Our team of concrete polishing professionals have collectively polished thousands of floors for both residential and commercial applications. Depending on the condition of the slab underneath, the size of the restaurant and the desired finish, this can all happen pretty quickly. About a week to 10 days after the slab is poured. Do not use any Bleach Based or Citrus Based Cleaners on a concrete floor. Do NOT add any retarding agents to a concrete mix that is going to be ground and sealed or polished. Retarding agents WILL affect the seal and may react badly with the polishing process. Simply apply a light sprinkle of water to the slab as required. Keep up to date with the latest information about CCC and concrete floor polishing methods and technology.